Birmingham City manager Gary Rowett admits that he is not surprised at all the transfer speculation surrounding Blues' prize asset Demarai Gray, ahead of the close of the August window. Reports continue to link 19-year-old Gray, a £5m target for Bournemouth in January, with a Premier League move. "Being the young talented player he is, it's not surprising there's a lot of speculation around him," Rowett said. "We know that speculation is going to hot up as the window comes to a close." 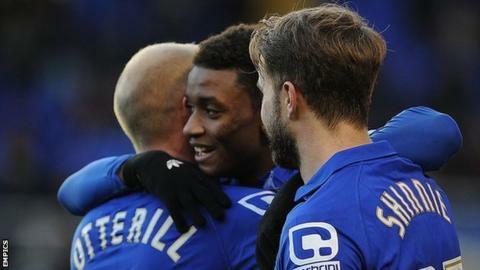 Demarai Gray has played almost every minute of all Blues' three Championship matches so far this season, helping them climb to ninth in the table, still unbeaten. "He's been really committed this season both in training and in matches," Rowett told BBC WM 95.6. "But, until someone says to me that Demarai is moving on or we have a bid accepted by the club, as far as I'm concerned it's 'game on'." Following reports linking Gray with one of his former clubs Leicester City, Rowett also sidestepped the issue of whether Birmingham-born academy product Gray, selected this week for England Under-20s duty, might have a buy-out clause in his contract. "Those details are for the club to know and not anyone else," Rowett added. "All we can say is that so far nobody has met any figure that we'd be satisfied with to allow Demarai to leave." Meanwhile, Blues' Welsh international winger David Cotterill, 27, has signed a two-year contract extension to his existing deal, tying him to St Andrew's until June 2018.